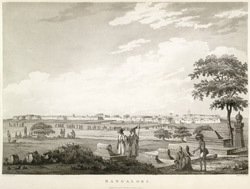 This uncoloured aquatint is taken from plate 2 of Captain Alexander Allan's 'Views in the Mysore Country 1794'. Bangalore is now the bustling capital of Karnataka state. Founded by a local chief Kempe Gowda in 1537, the city was ruled by Hindu dynasties until Haider Ali gained possession of it in 1759. It fell to the British under Lord Cornwallis in 1791, after one of the bloodiest skirmishes of the third Anglo-Mysore war. Cornwallis had resolved to attack Bangalore at night. Allan wrote: "commenced the assault at eleven at night, and surmounting a breach so uncommonly intricate and difficult, ... were in possession of every part of the fortress by twelve o'clock, after a slaughter of above a thousand of the garrison, rendered unavoidable by their firmness. The casualties of the British army amounted to five hundred men in this short but important siege, the event of which determined the conduct of the allies, and the future successes of the war." Bangalore was ceded to Tipu after the war.